Former Musti & Mirri CEO and Siili Solutions Co-Founder to help HUONE group scale to 10 new venues globally over next 2 years. (HELSINKI, Finland, November 16th) Events hotel chain HUONE International appointed its new board at the Annual General Meeting on Tuesday, November 7th, with newly-appointed board members Mika Sutinen and Mika Mäkeläinen joining the HUONE board. Sutinen was recently appointed 2017 Businessman of the year by the Association of Finnish Businessmen, and oversaw a five-fold increase in turnover as CEO and shareholder of Musti & Mirri during his time with the company. “HUONE intrigued me as a well-developed concept which is modern, innovative and strongly value-adding to customers,” said Sutinen. “I am looking forward to contributing value through my experience of internationalizing conceptual businesses abroad from Finland, and of course with leadership experience in complex multi-location environments,” he concluded. Serial entrepreneur and early-stage HUONE International investor Mäkeläinen is well-known for co-founding Siili Solutions Plc. He will take up his board position from January 1st, 2018 onwards. “I initially invested in HUONE because I believed in the leadership and drive of Evon Söderlund,” said Mäkeläinen. “As the group grew, it continually overcame the challenges it met, and with the knowledge it has now gained, has significant opportunity to scale its operations to more international markets. 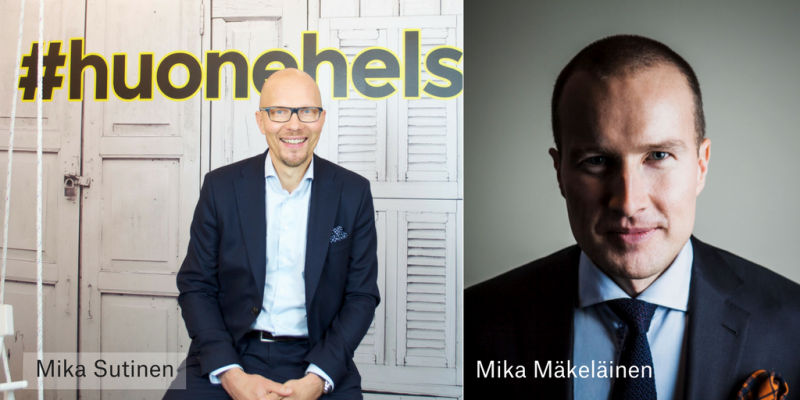 I am delighted to take up a board position within the Group,” concluded Mäkeläinen. Additional changes see Evon Söderlund step down as Group Chairman but retain a position on the board. Söderlund will also continue as Group CEO. Current board member and Takeoff Partners Co-Founder Markko Vaarnas has been elected to take her place. “I am thankful to the board for appointing me as Group Chairman, and am excited by the leadership potential of its members,” said Vaarnas. “We’re now in a strong position to collectively grow the Group and take advantage of new business opportunities,” he concluded. Juuso Kokko (shareholder) and Jussi Söderlund (shareholder) will retain their board positions, with the total number of board members remaining six. HUONE group announced 182% growth at group level for the 2016-17 financial year, with HUONE Singapore becoming profitable within the first 6 months of operation. The group has targeted continued growth in Helsinki and rapid scaling of Singapore for the next financial year, with expansion to a total of 10 new locations within 2 years.